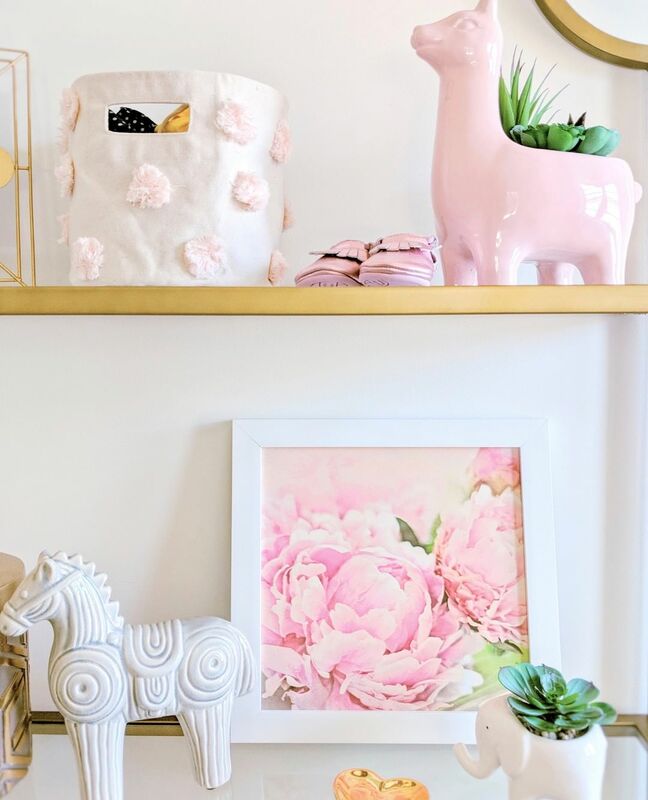 You may have noticed that I’ve been posting a lot of little hints about the nursery I’ve been working on for Jessi Malay. 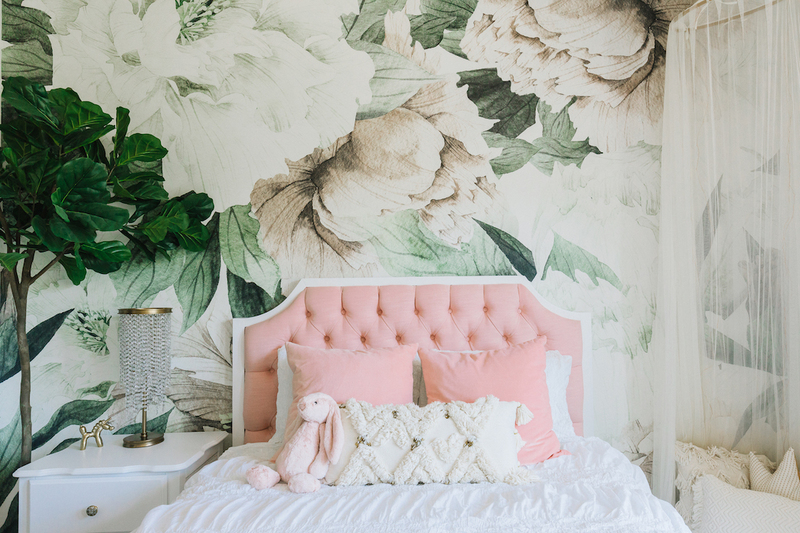 Jessi reached out to me and asked if I would help her design her daughter’s nursery in the new home they had just moved into. 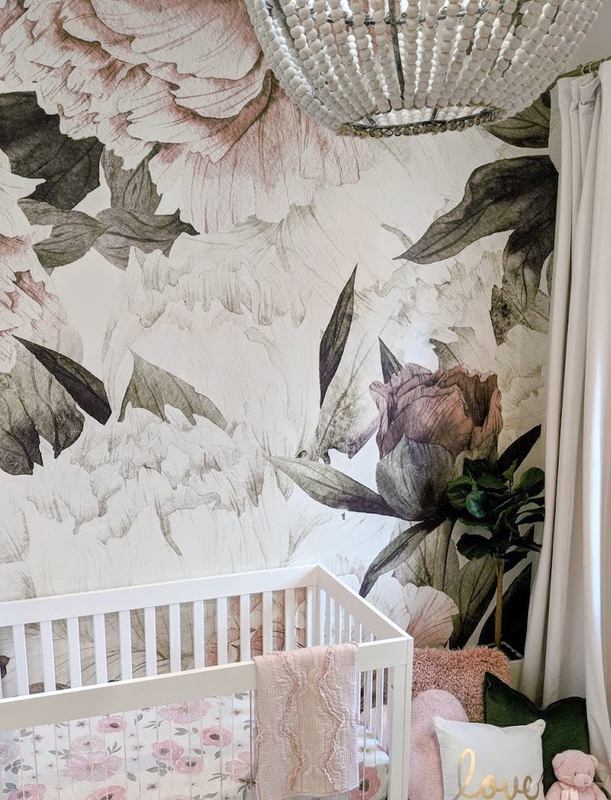 When I got to her home, I was thrilled to see that the nursery was full of natural light and had a gorgeous vaulted ceiling—it spoke to me and asked for a big ‘ol chandelier, which I happily agreed to (yes, ceilings speak to me on occasion). We sat down and talked a lot about what she wanted to see in the space. She wasn’t entirely sure, but knew she wanted lots of white, a crib with acrylic, and some type of statement wallpaper. I showed her an image (below) of a girl’s bedroom I designed last year with some pretty spectacular floral wallpaper and that was that! She feel in love with the wallpaper, and we were able to pull the whole design together after that. The first step (and the least fun) is the floor plan. It’s super important for me to lay everything out so I can make sure things will fit and that everything is in a safe location. We sat together while I drew up the floor plan on my laptop and I showed her what I suggested for the space. Onto the fun part—design! Jessi loved the idea of an acrylic crib, and right away I thought of the Babyletto Harlow crib. It’s modern, it’s acrylic and it’s white, so pretty much the perfect option for her. Jessi’s nursery isn’t huge, so we couldn’t fit a wide dresser in here along with a glider, so we chose a medium sized dresser from Newport Cottages and customized the heck out of it (luckily that’s what they do). All white, satin finish with specialty gold hardware. Almost everything else in the room I chose from Joss & Main. They have such a huge selection and happened to have a ton of items in the color scheme we were going for. 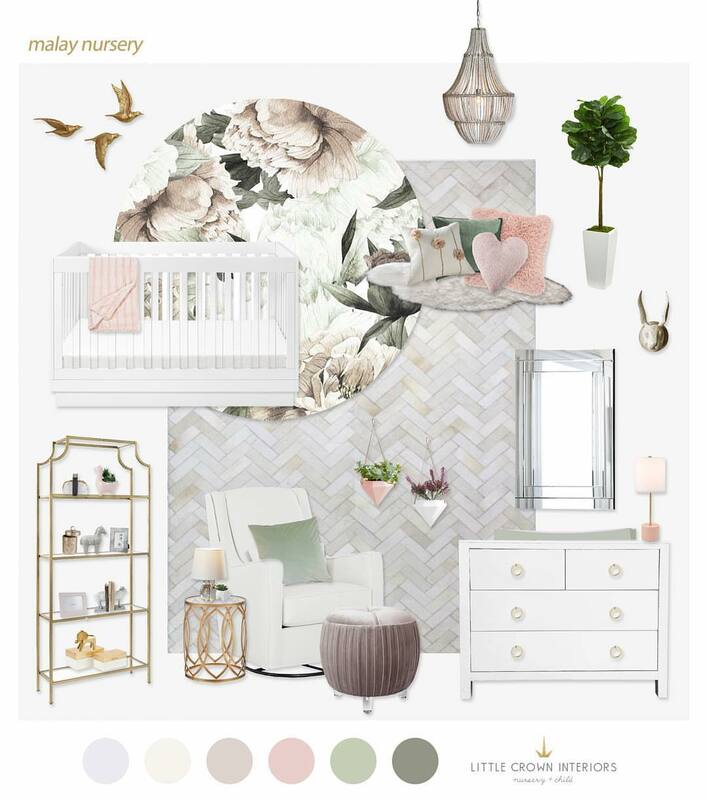 Every item I chose for her, I put together in the nursery design board above so she could get a feeling for what the design would look like. We edited a little and refined the design, and then moved on to ordering. A few weeks later, I came back to install the room! There was a ridiculous amount of boxes in her entryway and it took us over an hour just to open them all up. By the way, opening boxes is one of the most exciting parts of my job—it’s like Christmukkah morning! Getting everything installed is always a challenge, but we did it. 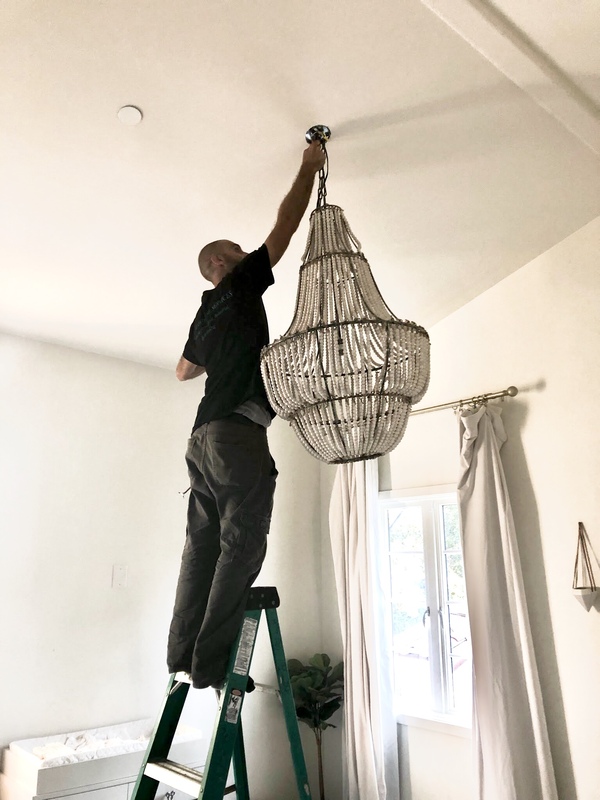 We debated on the perfect height to hang the chandelier and I watched nervously every time someone got up on a ladder. After the installation was done, I got to swoop in and do all the styling. We had a full etagere bookcase in this room and I styled the whole thing out with cute little decor pieces, succulent plants, artwork, etc. Here’s a sneak peek of the room, but that’s all I can show you for now! We photographed the room last week and I’m so excited to share the full reveal! Follow me on Instagram for the latest updates and to see the reveal when it’s published!